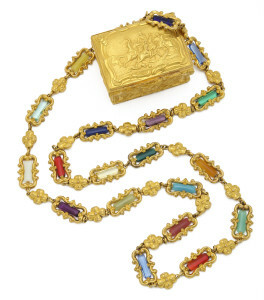 This snuffbox and necklace are made of pinchbeck, a brass alloy imitating gold. The snuffbox commemorates the 1745 Jacobite Rising, culminating in the victorious Battle of Culloden. The repoussé cover depicts a scene from the battle. The necklace, made circa 1880, features multi-colored hardstone and glass panels in pinchbeck rocaille frames. While a little over a century separates these pieces, they share a curious and ingenious history. The English clockmaker Christopher Pinchbeck (1670-1732) observed that brass containing between 12 and 15 percent zinc strongly resembles gold and so invented the alloy that bears his name in the 1720s. High gold hallmark standards of 18 and 22 carats at the time confined fine metalwork to the wealthy, but through his genius, Pinchbeck now brought ‘gold’ to the people, catering to those of modest means for whom precious metal objects were inaccessible. But the alloy also appealed to the wealthy, using it to make copies of their valuables for traveling. Necessary travel accoutrements like buckles, watches, and sword-hilts made of pinchbeck could deter the attention of highway robbers. These pieces exhibit the many benefits of the material. First to note is their luster despite their age. Pinchbeck has superior wearing quality and retains its bright color, unlike other imitation gold metals. Also, because pinchbeck is lighter in weight than gold, larger pieces, like this necklace, are easier to wear. Christopher Pinchbeck was very guarded about the true contents of his alloy. The clockmaker had a fondness for spectacle, making musical clocks and automata among other objects. Thus, it is not surprising the true formula of his namesake metal remains a mystery. He passed it on to his son, and so true pinchbeck is said to have died with him, as others struggled to duplicate it accurately. However, as this necklace attests, later concoctions did succeed in replicating the pinchbeck of the previous century.